Christmas Giveaway #4: The Most Adorable Etsy Package Ever! Have you ever browsed on Etsy? It's a dangerously wonderful place. If you've never heard of Etsy, it's essentially an online marketplace for amazingly talented people to sell anything (and just about everything) that's handmade. I am in awe of the talented people that have shops on Esty. I am not very crafty - I don't know how to sew or knit or crochet or paint or draw or make pottery or any of the other simply amazing things people can do with their hands. One day this fall, I was browsing on Esty and stumbled upon Kiki's Crochet. I was looking for some type of chapstick holder - because my chapstick is permanently buried in the bottom of my purse or Pouchee and I can never find it. And, I LIVE IN THE MIDWEST, people. We likey our chapstick. Crocheted chapstick/lip balm holders. That are also KEYCHAINS! Or they can be attached to a purse or wallet or beltloop, or I don't know, just about anything. And, each one has an adorable flower button closure. OH SWEET MERCY, I'm in love. Especially with this one. I represent any and all things pink around here. I love this pink one. And, then I started clicking around. I did warn you that Etsy is dangerous, right? And, I found myself wide-eyed and gasping over this. 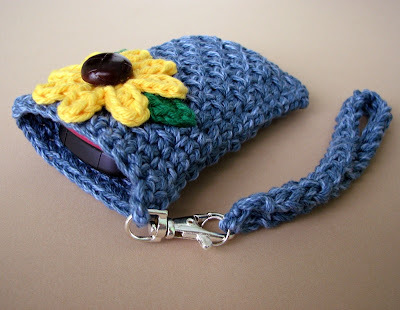 The most adorable cell phone/iPhone/BlackBerry/iPod/gadget holder I'd ever seen. It has a wrist strap which I LOVE. But, the strap detaches. So, you can use the clasp to attach it to a purse, or wallet, or beltloop, or I don't know, just about anything. How absolutely adorable is this flower? Pink anyone? My sister, Emily, is drooling all over her computer screen right now. This is the smaller version. So dainty. I love it. Kristy also crochets Face Scrubbies. I LOVE this set. You won't believe how soft these are. 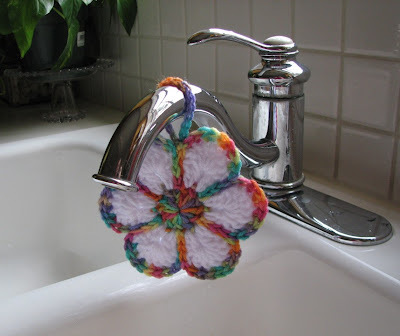 She also crochets Acrylic Flower Scrubbies. Your dishes have never been cleaned by something so useful and adorable. Is there a limit to the number of times one is allowed to use the word "adorable" in one blog post? If you love to crochet, you can purchase PDF patterns on Kristy's shop for just about everything she makes. 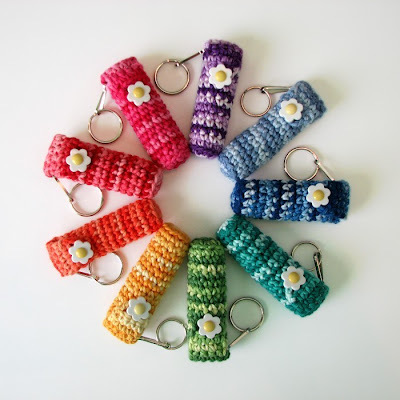 So, if you're handy with crochet needles, you can make these things on your own, too. I love it that Kristy shares her "recipes". I find her a kindred spirit in that way. Today, for the last Short Stop Christmas Giveaway, I'm gonna send one of you a whole package of Kristy's AWESOME crocheted items. A set of Face Scrubbies. That's more "adorable" in one package than should be allowed. I love handmade gifts like these. I love things that are unique and wonderful and different and that a crafty and creative person like Kristy put their time and talent into making. And, when you support someone by purchasing items on Etsy, you are supporting an entrepreneur. A business owner. A fellow Mom. I LOVE that about Etsy! 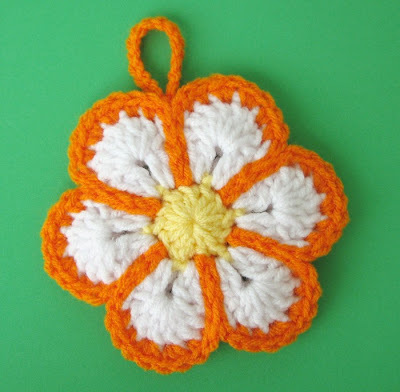 Click over to Kiki's Crochet and browse around. Leave a comment telling me what item you like the best. 3. Post a link to this giveaway on Twitter. 4. Post a link to this giveaway on your Facebook page. You MUST leave an additional comment for EACH of these things that you do so that the random thingy will count each of your entries. If you only leave one comment letting me know all of the things you did, you'll only get one entry. BOOOO! This giveaway will be open until Sunday night, December 20th at 8pm. I'll let the random thingy choose a winner and I'll announce the winner on Monday mornin'. *Disclosure: At my request, Kristy sent me a sampling of her items to review so that I could share this giveaway with you. 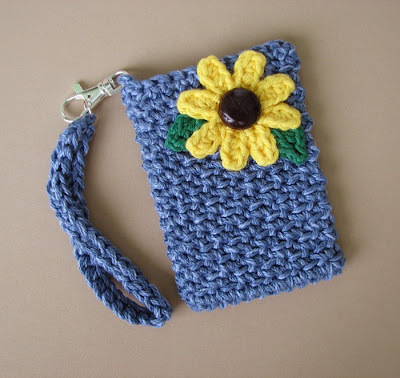 I love to crochet and these are indeed adorable items! Oh my heart....the sweet little pink pouch/purse.....TOTALLY getting that for Jenna. She's all about bags right now. LOVE this site! Love them and just ordered a few items!! and of course, i'm already your fb fan. I need a cell phone pouch. Real bad. That thing gets lost in the vast abiss of my purse. i so *heart* the purple beanie on her header but it's not in her store :( if i could crochet i would totally purchase a pattern for the water bottle holder - that would be a lifesaver in my house - we're always wondering which bottle is ours :) so i guess that my favorite thing actually in her store is the cute little drawstring purses! I love her little drawstring bags! Adorable! I like the chapstick holders best!!! So creative!!! I am so jealous Erika won the ice cream thing! I posted it on facebook! Adorable is the best word! Love them all! Though, with a little toddler girl who is into everything girly and pretty, that little purse would fulfill her dreams completely and I would be hero for at least a day! Just subscribed to recieve in my email! Just posted this link to my FB page! I love them all!! So ... adorable! My favorite is the cell phone pouch- so cute! Oh.my.goodness. That stuff is SO adorable! I think I might go into sugar shock! So cute! I do just LOVE the little lip gloss holders. A favorite color? Well, "I couldn't any sooner choose a favorite star in the heavens." Sarah! These are absolutely...ADORABLE!!! Love! I have to say that the chapstick holder is definitely me. I'm always the one who has to have chapstick in her purse or pockets. Can't live without it! :) I am such a pink girl too! Etsy is wonderful! Thanks for sharing and I hope I win!!! These would make wonderful gifts! I love the sink scrubbie. So cute. Of course I'm already subscribed! 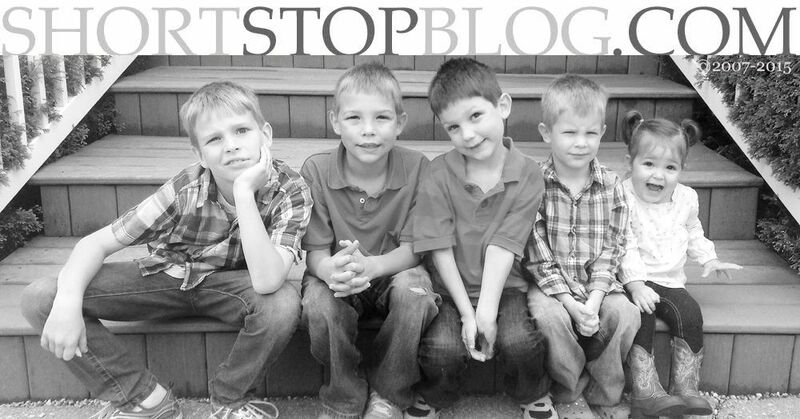 I look forward to your blogs everyday! Am a fan of you on Facebook as well! Can't wait to send my friends a link! Posting a link on my facebook page? Of course!!! Now my job is done and it's all in God's hands. I like the drawstring bag! I love that shop-she is a creative girl! I love the chapstick holder, and I will be buying one if I don't win. those are really cute items. at first, i didn't think i would want any because i'm not a crochet kind of gal. but after looking at them, i realized i really would like a couple of them. i think the lip balm covers are the best. i have lib balm everywhere cuz i always am using it. i'd love to be able to put one on my key chain and always know where it is. and the cell phone cover is cute, too. oh, and i am a subscriber, too =) great give-away. I luvs me my chapstick. It is always with me, so to have something cute to keep it in would be great! You are in my Google Reader, does that count? Wow - she is talented!! I love the scrubbies - the cherry blossom is my fave! My favorite thing would have to be the Flower Scrubbie in candy colors and white. I think I subscribed....not sure if it really went thru!!! I think the scrubbies are adorable however I love the little bags the most. I think they are so sweet and little Girl I would totally stuff them with a bouquet of onsies as a baby shower gift. I liked the cell phone holder! Would like to attach one right to the inside of my purse. Also like the chapstick holder because Ella is always wanting her chapstick and I can never find it in with my lipsticks and stuff! I am already a facebook friend! I like anything cute and pink--so the chapstick holder is a favorite! :) Thank you! I'm already a Facebook fan---I'm going to purchase something from that little site regardless of winning...her things are so unique. Wowsers, your right. She has lots of cute stuff on her site. I think though my fav is the chapstick holder. It is adorable and I've never seen anything like it. What a fun give away Sarah!! I just became a fan on facebook earlier today! I already subscribe to your blog. I always click to read when you get a new post up! Your one of my favs!! Just twitted your give away! just posted the give away on facebook! I love the little purple hat in her store's header! I hope she makes more of those!! I am a face book fan too! drink cozie -- i know... of all the things, but i take a water bottle to work everyday -- it would just make it more "enticing" to drink more of it :) btw, got my bible today -- cannot wait to start reading it with my 5 year old. The chap stick holders are too cute, especially since I keep lip glosses that are the same size and they are always getting lost! I'm addicted to chapstick and love the little purple holders! I love all the ones you showed - and also the cute little orange and pink Drawstring Bag/Pouch, which looks like it would be perfect to keep current knitting/crocheting projects in. I'm definitely going to check out her patterns - thanks! I looked around the Etsy shop and I think my favorite is the Chapstick holders. We always seem to be misplacing our lip balms. I am already signed up for the RSS feed. Does that count? Love, love the chapstick holder. What a great idea!! I like the cotton scrubbies. I have not seen those before. Those lip balm holders are adorable!!! 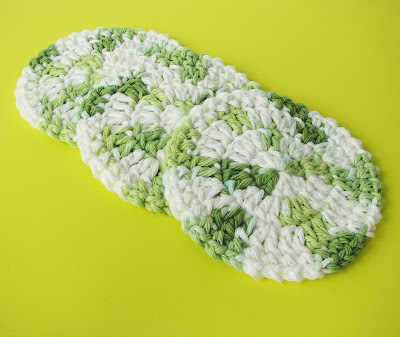 And the flower scrubbies are pretty cute too. I'm all about the chapstick holder! Although I call it "lippy" and I'm sure my 2 year old daughter will be swiping it as soon as I clip it to my diaper bag. Still. ADORABLE. Became a fan on FB. Spread the ShortStop word!! Link posted to Facebook! 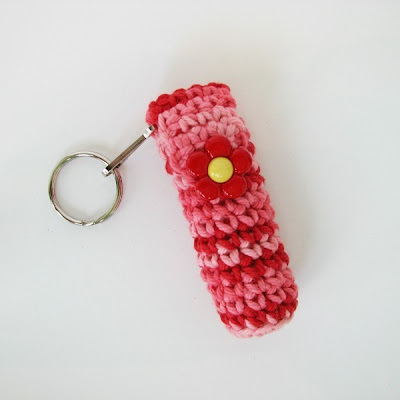 Crocheted items, come to mama! already subscribed to your rss feed. The strawberry Felted Puff Bag would have to be my fav, but those drink cozies are absolutely adorable as well! Can I still enter even though I won the last one? I'm gonna. Oh, and I'm so a fan on Facebook! Oooh adorable shop! Colourful! Love the darkest blue and the blue and white chapstick holder. I love all the Chapstick / Lip Balm holders, they always go to the bottom of your purse, these would solve that problem. And so cute!! 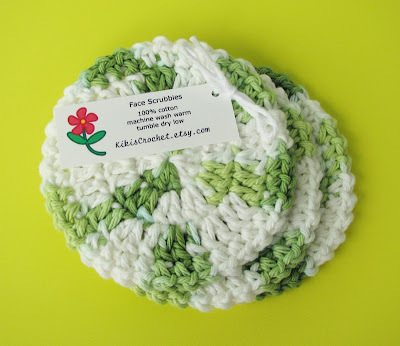 Love the cherry blossom cotton scrubbies! You are a hoot and a half. Of course you started this FB thingy right when I'm fasting from it. I did subscribe, but that no longer counts since I'm fasting and all. Maybe Dave would like something cute in pink, LOL if he subscribes. The cell holder is waaaay cute. I'm always hunting for mine in my purse somewhere. I love the chapstick holder. The felted drawstring bags are adorable! I love the watermelon one that she has posted with the pattern. I like the Ultra Soft Cotton Scrubbie Set. I am never without my chapstick, and I love the chapstick holder!! I like all the things...but I like most: "Chapstick / Lip Balm holder". I love the Cotton Scrubbie Set- brights! So pretty! I likey the chapstick holder. That is so darn cute! 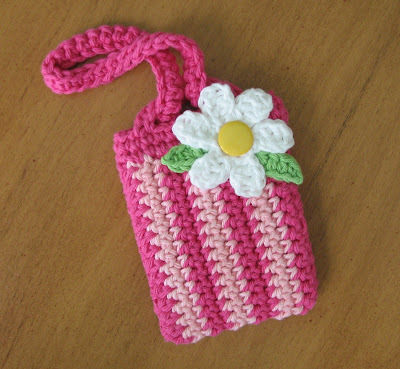 My daughter said the Flower Scrubbie - hot pink / white is her favorite.